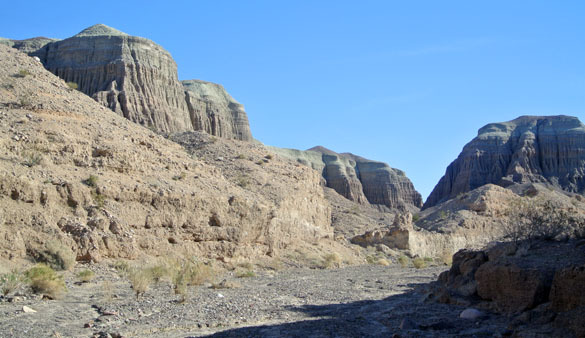 Exploring the Tecopa region … and finally the trilobites! 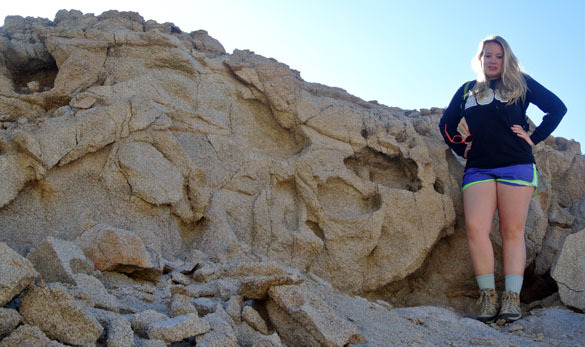 ZZYZX, CALIFORNIA–This was our last full day of geological adventures in the Mojave Desert for 2013. 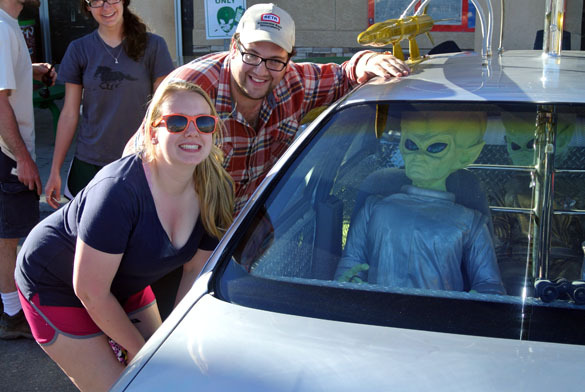 The weather was even warmer than yesterday, with the temperature in Baker at 4:00 p.m. a delightful 94°F. 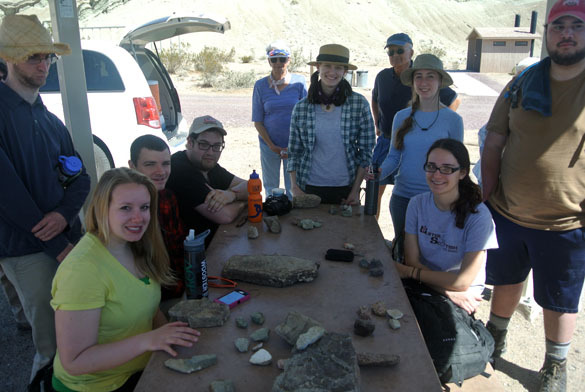 We began in the usual way from our temporary home at the Desert Studies Center, heading north of Baker again to Shoshone and the Tecopa area. 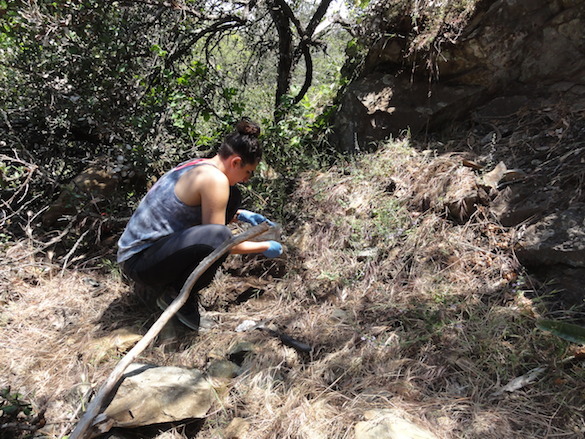 Our first stop was at Salt Creek Spring in the Salt Spring Hills, one of the rare riparian environments in this part of the desert. 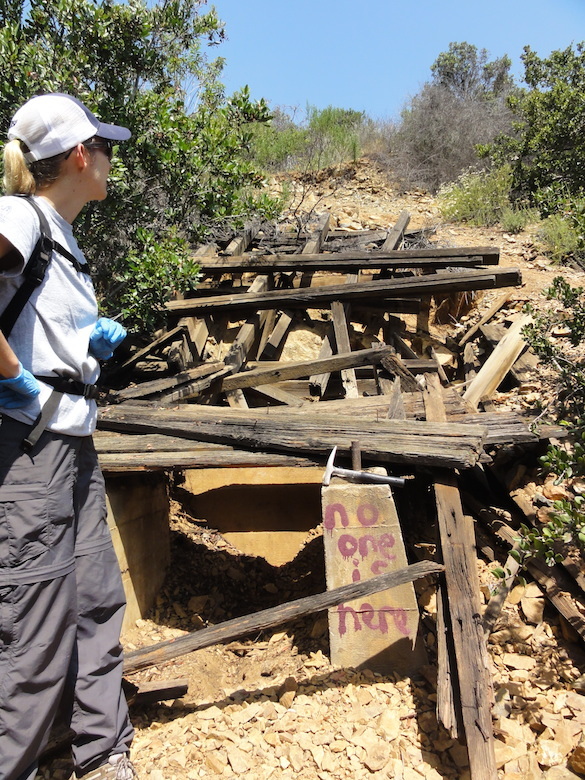 This place is also notable as the first place gold was found in southern California. 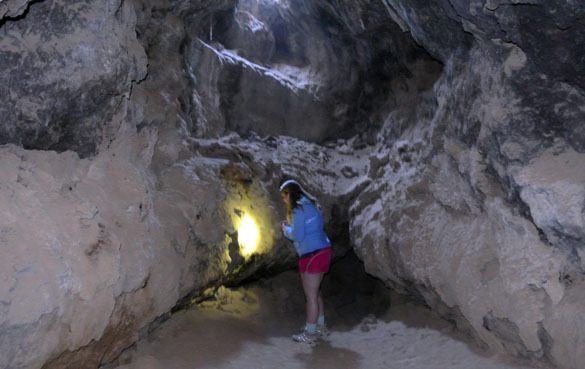 This discovery in 1849 began the boom in mining throughout the Mojave Desert. 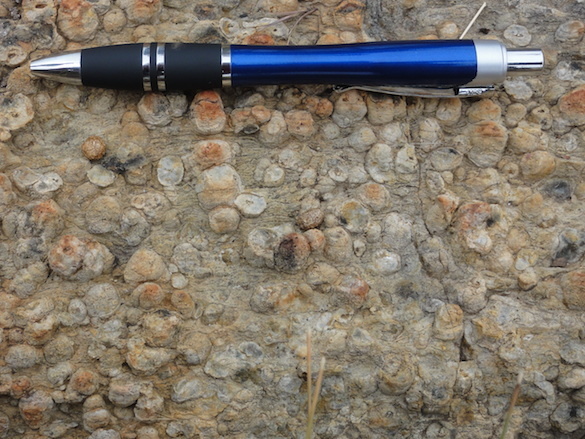 One of the interesting geological features we noted was the occurrence of the familiar tafoni, but this time in a deeply eroded outcrop of quartz monzonite (shown above with Melissa Torma). Our companion Yoav Avni believes this may represent a Pleistocene pluvial phase of erosion that has been exhumed in the modern landscape. 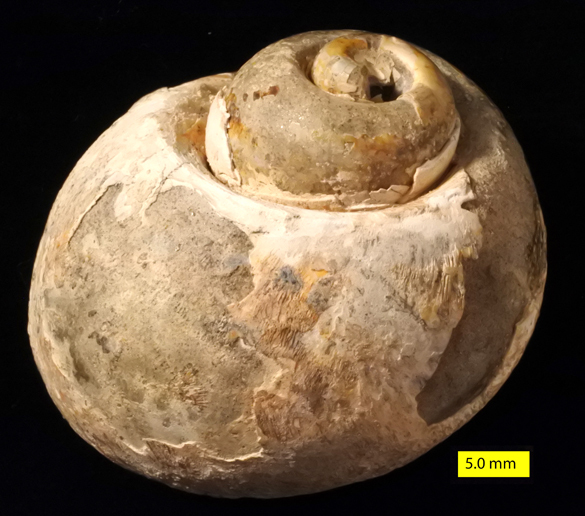 Tafoni features in granite would seem to require more water than is present today in this system, thus placing these features during a wet interval makes sense. We next returned to the little settlement of Shoshone, this time visiting the town museum (above). 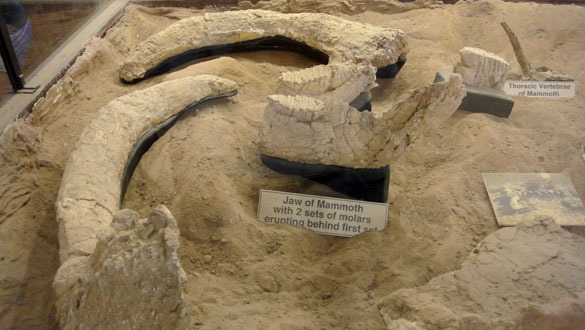 It is well worth touring for its local artifacts, some wildlife displays, and the bones and teeth of the Shoshone Mammoth found in the Tecopa lake sediments. 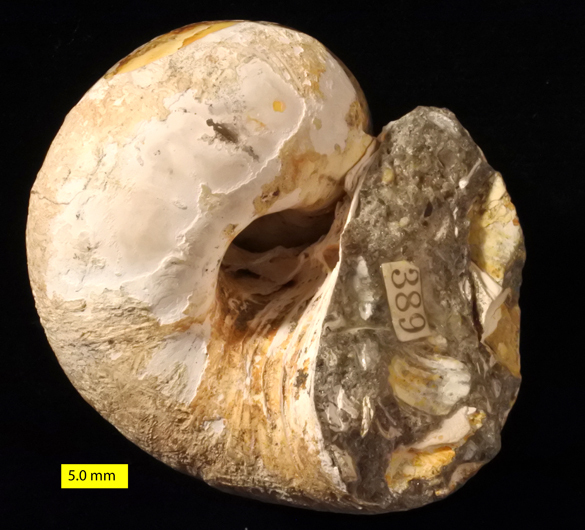 The mammoth (Archidiskodon tamenensis on the sign) has been very well preserved by the lake clays and silts, especially the diagnostic teeth and jaws. 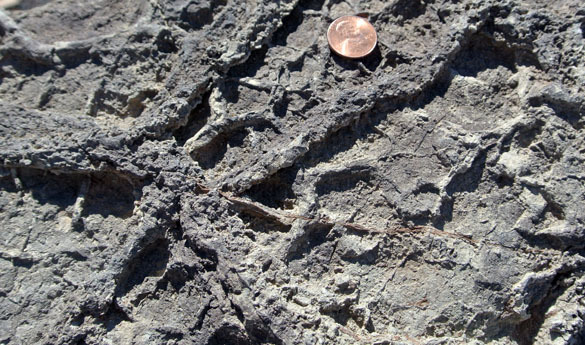 It is an impressive find and an important addition to our knowledge of the ancient Lake Tecopa ecosystem. 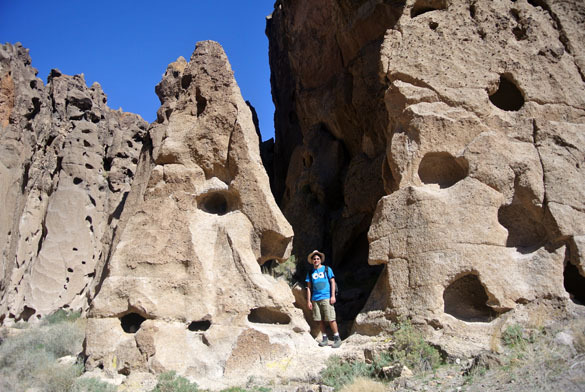 The Resting Springs Welded Tuff exposed east of Shoshone is one of the most famous roadcuts in the Mojave Desert. Above we see Olivia Brown exploring the glassy black middle of the unit. 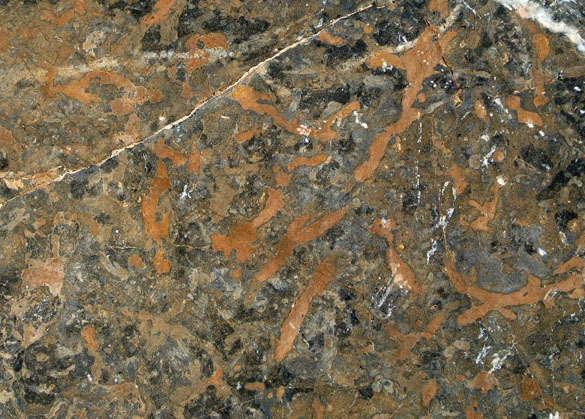 The colors and hardnesses of the rocks here show degrees of welding from the intense heat developed in this pyroclastic flow. 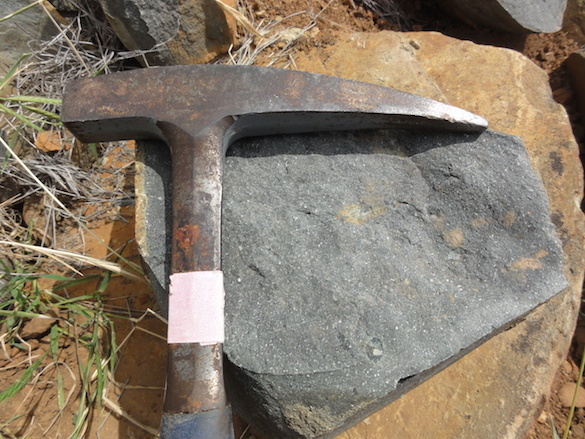 It is technically a devitrified pumice tuff, welded tuff, and vesicular vitrophyre dated by K-Ar methods as 9.5 million years old. 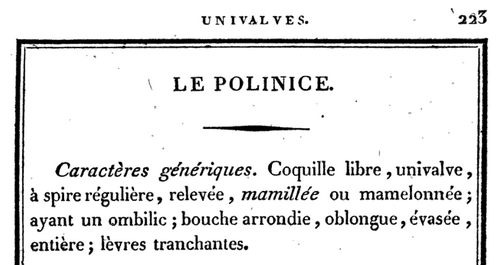 The fiamme are fantastic. 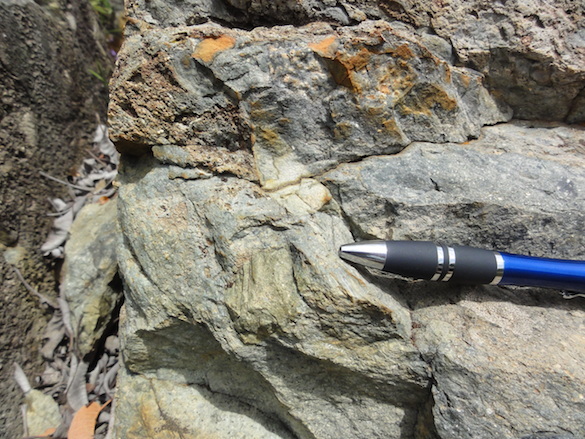 In the same outcrop of the Resting Springs Tuff are some impressive faults. 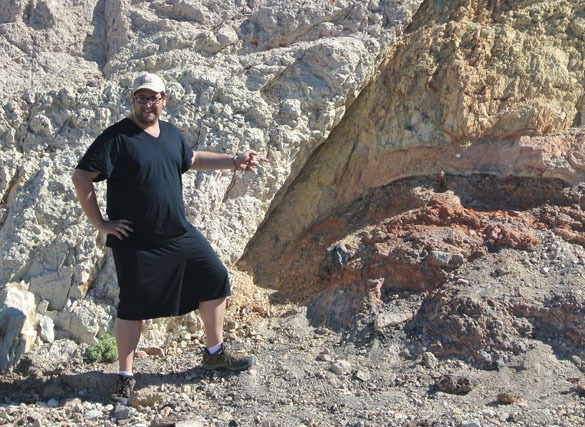 Jonah Novek is showing above how he knows this is a normal fault because the drag fold shows downward movement of the hanging wall (the side he is standing on). 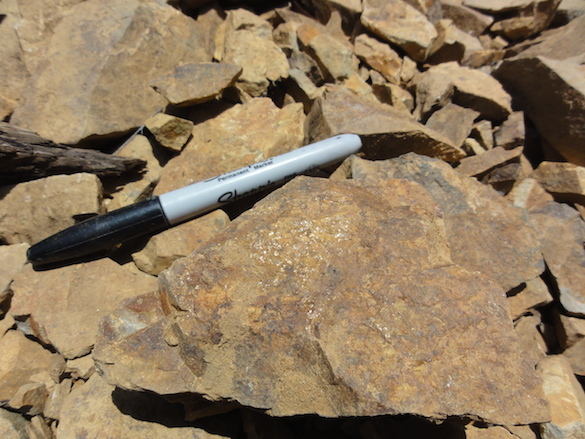 At lunchtime we arrived at Emigrant Pass east of Tecopa to collect trilobites from the Cambrian Carrara Formation exposed on the north side of the highway (which happened to be the Old Spanish Trail). 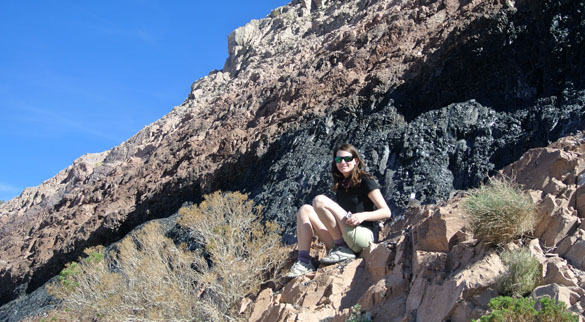 After a bit of exploring, our ace field geologist Shelley Judge found the most fossiliferous outcrops. 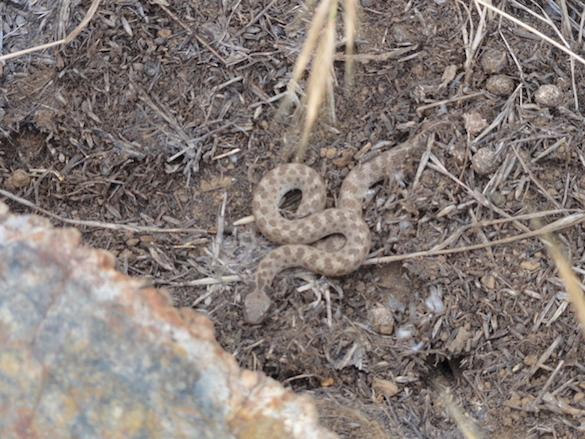 We found hundreds of the fascinating critters, leaving most for future field trips. I like the view above, by the way, because it shows Telescope Peak on the far distant skyline. 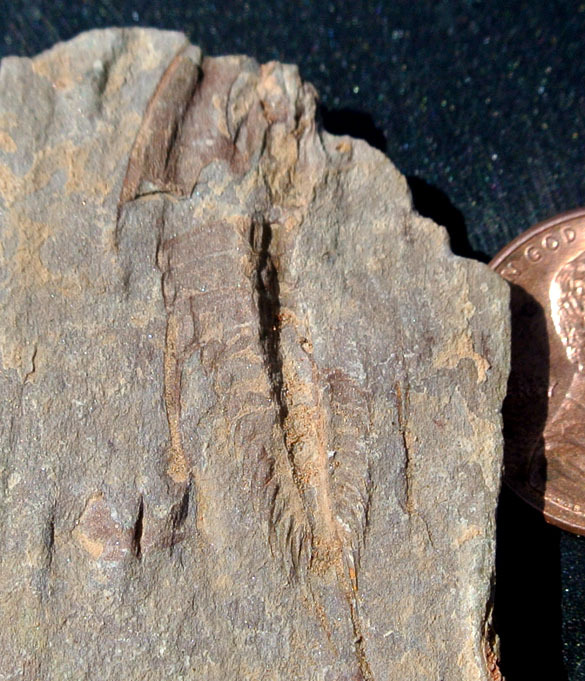 The best trilobite of the day (and there were many good specimens) was collected by Olivia Brown. 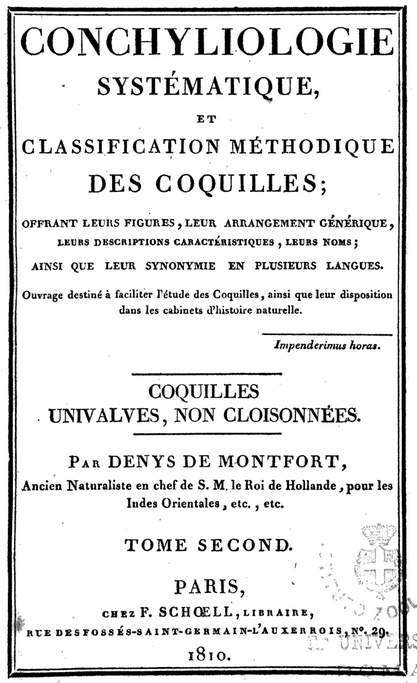 It is a rare whole specimen, apparently of the genus Olenellus. You can see all the thoracic segments and spines, as well as the pygidium. 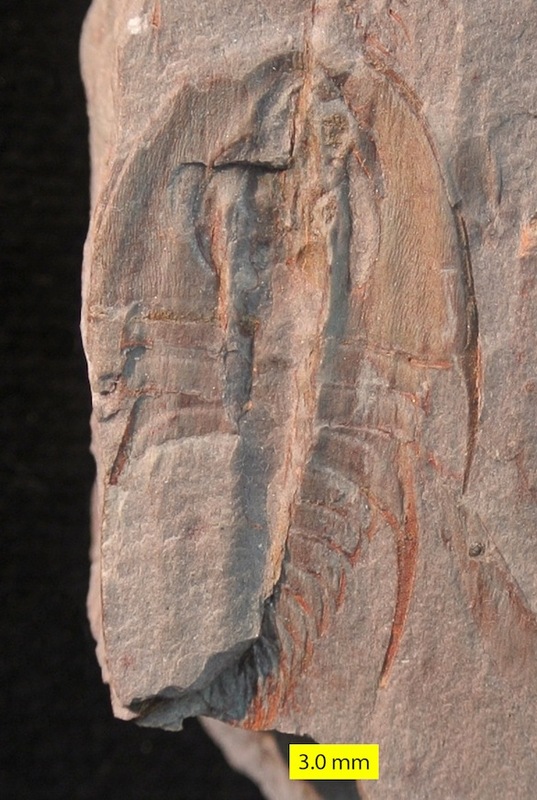 The way the cephalon is separated from the thorax may indicate that it is a preserved exuvium (molt). Very nice. 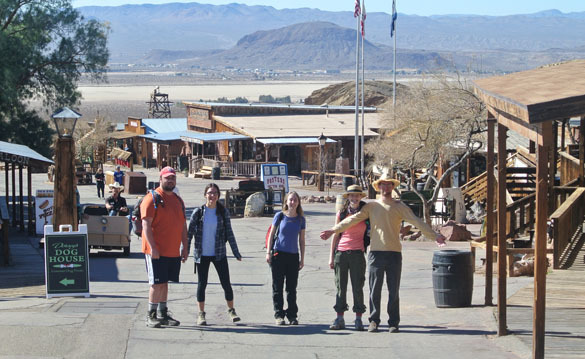 Following a geological tradition transferred from Sonoma State University geologists to us via my friend Matthew James, we visited China Ranch south of Tecopa and had date milkshakes. Delicious and refreshingly cool on what turned out to be a very hot day. 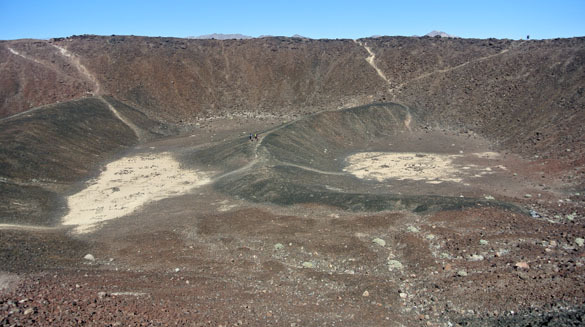 We also had a good geology lesson with the fanglomerates and ancient lakebeds exposed around the date groves. 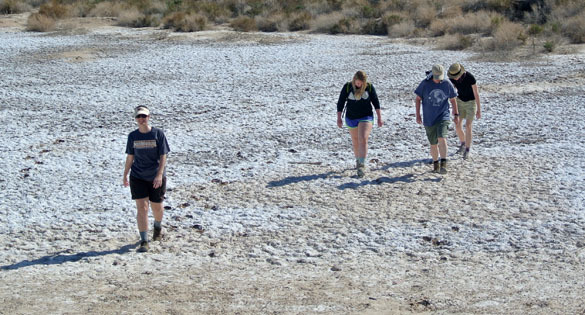 While driving out of Tecopa, we stopped to walk out onto the Lake Tecopa playa, which was covered by a thin crust of salts. From the left are Meagen Pollock, Melissa Torma, Shelley Judge and Olivia Brown. 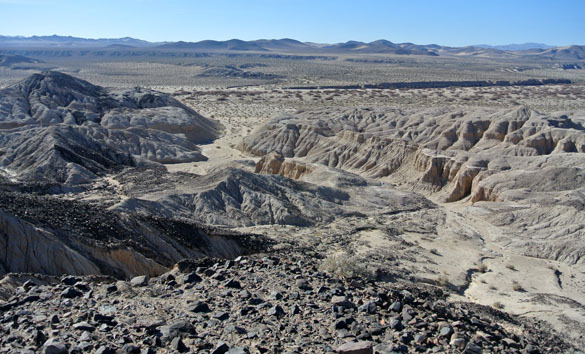 We observed the modern playa sediments juxtaposed with the ancient lake strata exposed as low mounds. 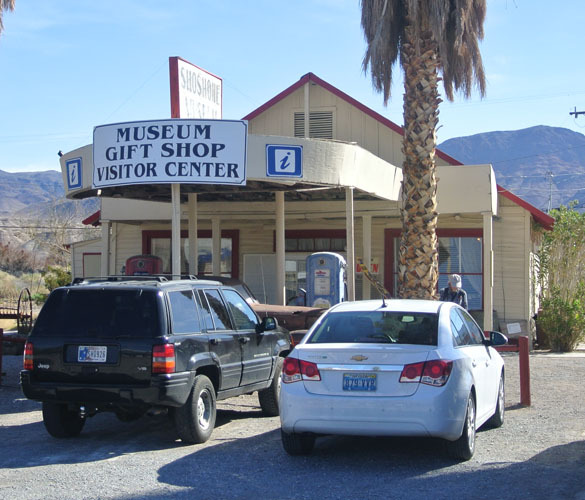 Last of all was a stop to briefly recognize the Harry Wade exit route out of Death Valley at an historical marker on the highway back to Baker. 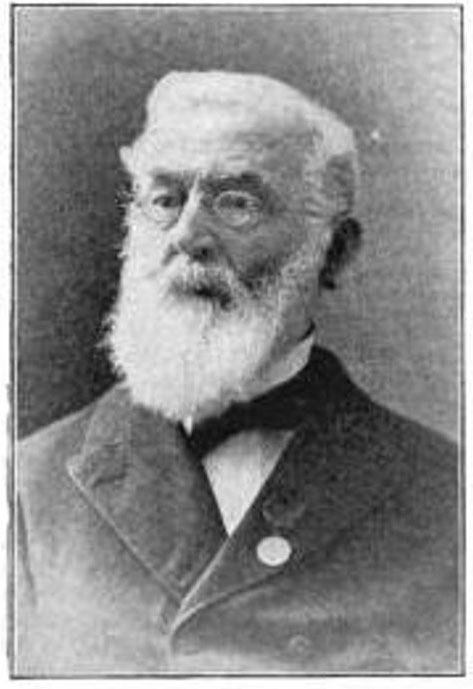 We came full circle at this point, since we started with Death Valley and now ended looking back into that source of such hardship in 1849. Our final scientific event of the day was an excellent tour of the night sky by the Laboratory Technician of the Vassar College Environmental Sciences and Geography Department, Rick Jones. The sky is very dark and inviting in this lonely part of the desert. 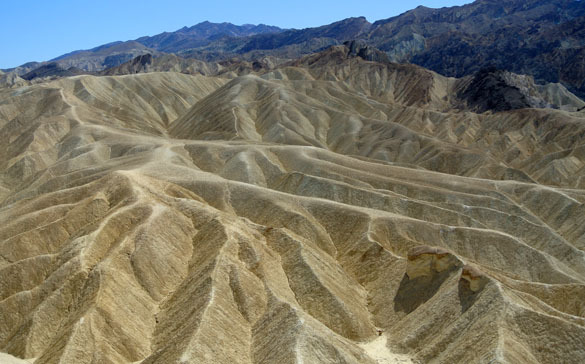 DEATH VALLEY, CALIFORNIA–All geologists love Death Valley. No other place on Earth has such extraordinarily diverse geology combined with a modern infrastructure and a century of scientific study. 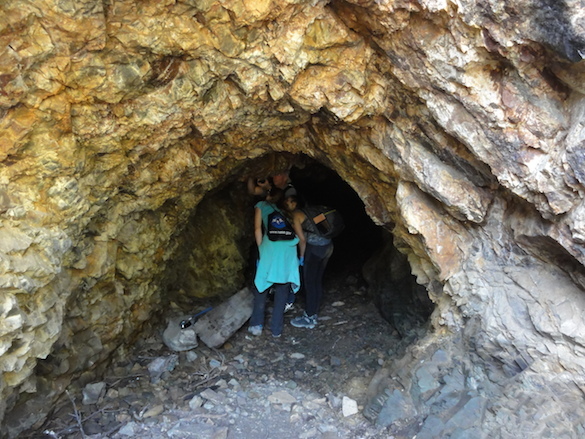 The Wooster Geologists had a spectacular time in and around the valley today. 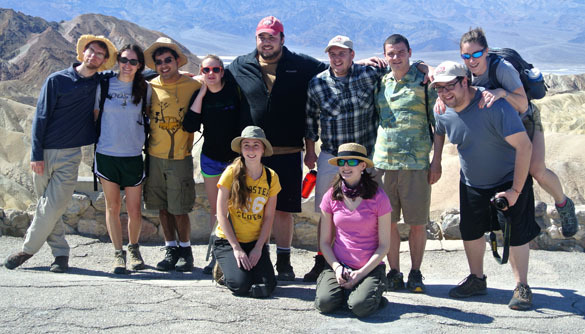 Here we are above with the traditional group shot at Badwater. The weather could not have been better. We left the Desert Studies Center at Zzyzx just after breakfast and drove through Baker and Shoshone to the southern end of Death Valley, seeing many wonderful sites. After lunch at the new National Park Service Furnace Creek Visitor Center, we then drove east and up out of the valley to Zabriskie Point. The above view has been published countless times by geologists and nature enthusiasts, but it has not lost its graphic power. 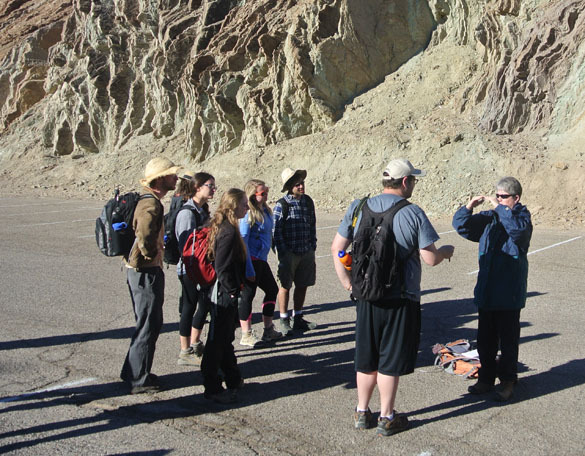 We are looking here to the west at deeply eroded lake sediments of the Furnace Creek Formation. Towards the back of the light-colored material you can just make out the black streak of a basaltic intrusion. 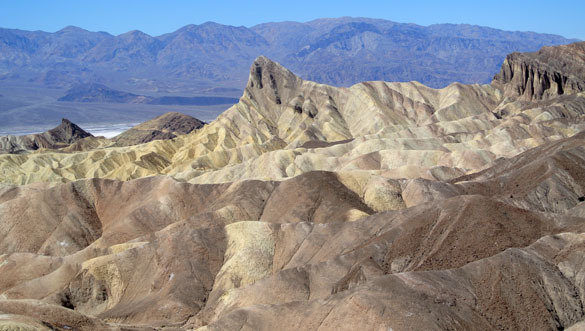 I think the other side of Zabriskie Point — the side looking out over Death Valley — is even more impressive. 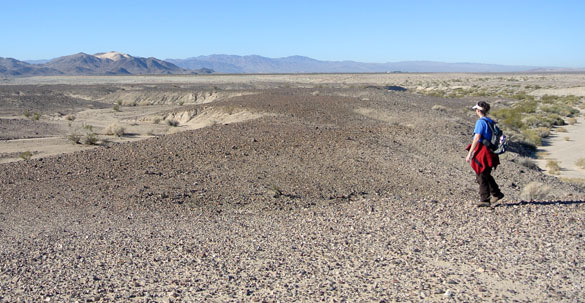 We see again the Furnace Creek Formation lake sediments, this time with alluvial deposits on top (visible on the right). 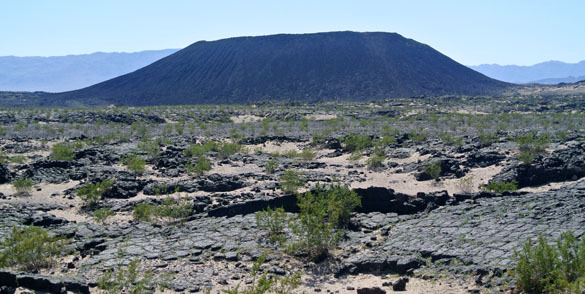 These materials accumulated in an ancient lake and were lifted up and tilted by the tremendous faulting that formed Death Valley. The pinnacle is called Manly Beacon. 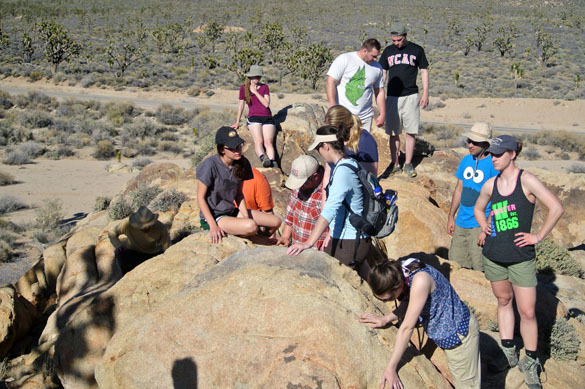 We took advantage of the sunlight and high spirits to take a picture of our Desert Geology 2013 students. 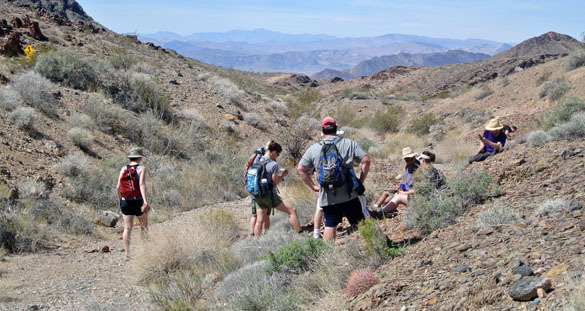 We continued east and then south to Dante’s View, where we looked down into Death Valley from the dizzy heights. 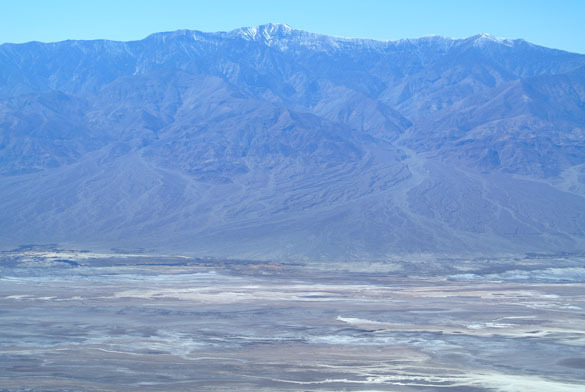 In this image we see Telescope Peak towering at 11,049 feet of elevation, while much of the valley floor below is lower than sealevel. 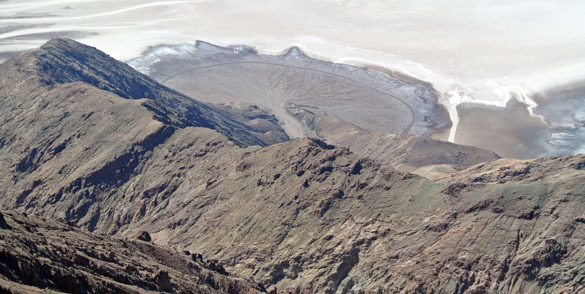 Looking straight down from Dante’s View to Badwater (on the far right), we can see a complete alluvial fan from the narrow channel in the mountain slope to the spreading apron of debris over the salt pan on the valley floor. Badwater Road skirts the periphery of the fan. 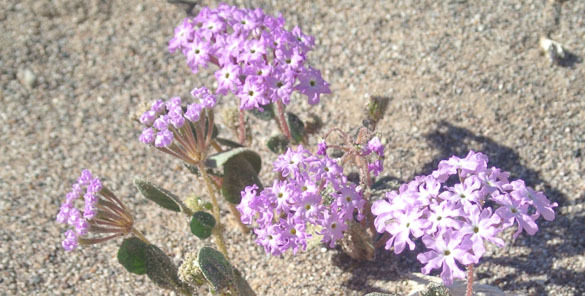 After Dante’s View, we continued east and returned to Zzyzx via Death Valley Junction, Shoshone and Baker. Again, I can think of nowhere else one can see so much geological diversity in a single day, from the steamy floor of Death Valley to the heights above where we could walk through patches of snow. 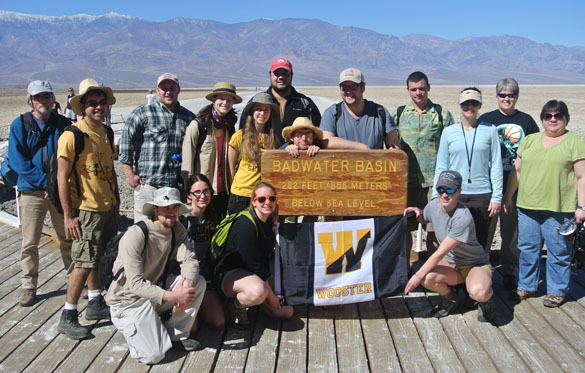 ZZYZX, CALIFORNIA–It is officially now a Wooster Geology tradition: every other year we take a Spring Break field trip with students, faculty and staff. 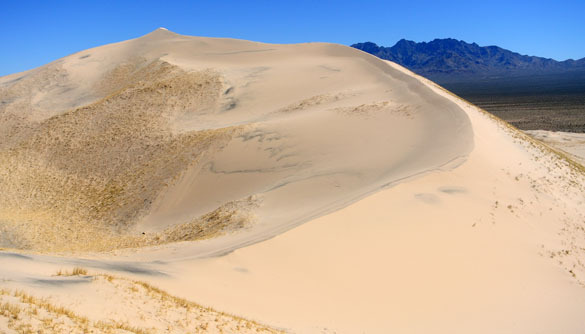 So far all of our trips have been to the Mojave Desert, for reasons that will be apparent in the following posts. 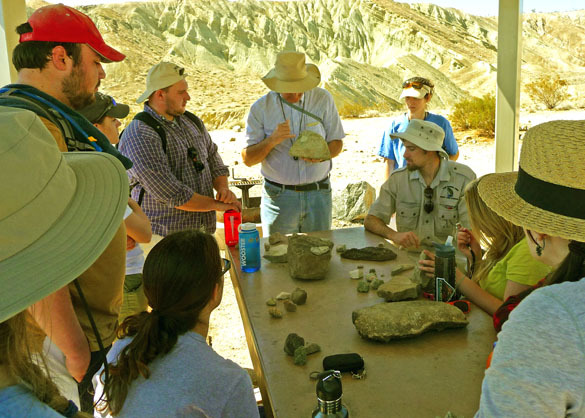 This expedition is the highlight of our Desert Geology course this spring. 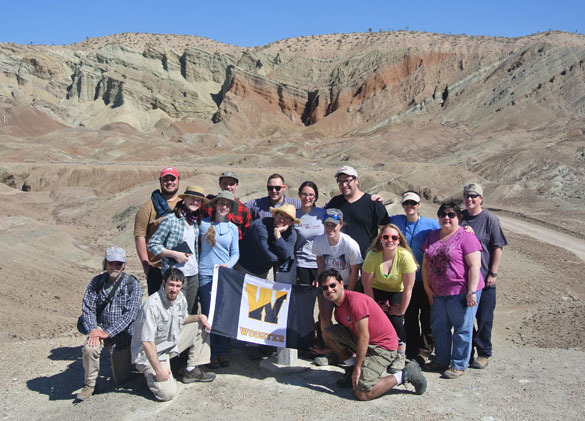 This year we have the largest group yet: eleven students, three faculty (Meagen Pollock, Shelley Judge and me — Greg Wiles could not join us because of his leave activities) and two staff (Administrative Coordinator Patrice Reeder and Geological Technician Nick Wiesenberg). We are delighted to also have with us Yoav Avni, a desert geomorphologist with the Geological Survey of Israel (and my good colleague and friend). Four vans of enthusiastic geologists! We left Wooster very early this morning (5:30 a.m.) to catch a non-stop flight to Las Vegas from Cleveland. After picking up our vehicles at the Las Vegas airport, we drove to the Desert Studies Center (DSC) in delightfully named Zzyzx, California. We’ve stayed here many times before. 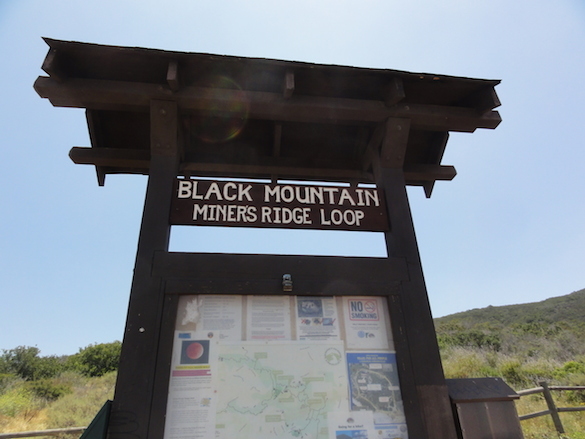 The station is shown above from the mountain just to its west. Astute observers who visited this little paradise before may notice on the far right side a new solar array to supply electricity to the facility. It is all off the grid and self-contained. 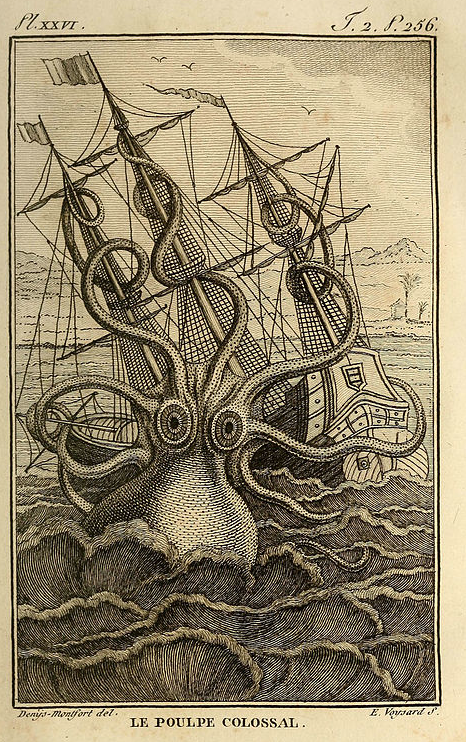 It feels in some ways like being on a ship at sea. 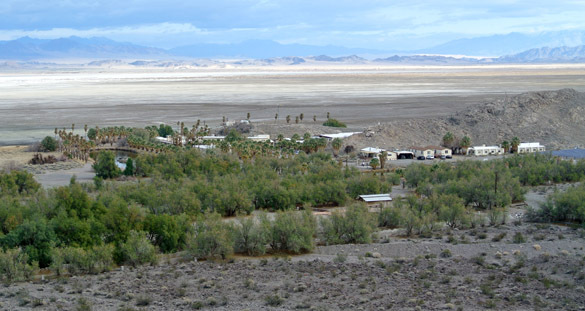 On the far side of the station you can see the expanse of Soda Lake and some of the mountain ranges in the Mojave National Preserve. 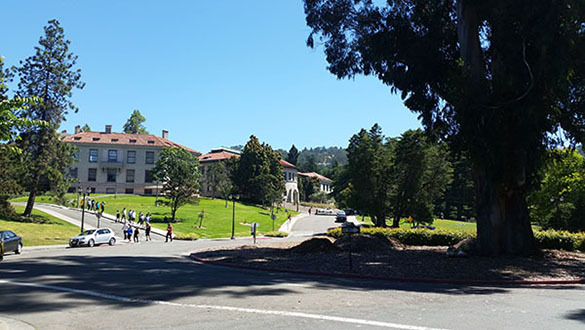 This year we arrived a bit earlier than usual, so we got a chance to explore the neighborhood around the DSC. 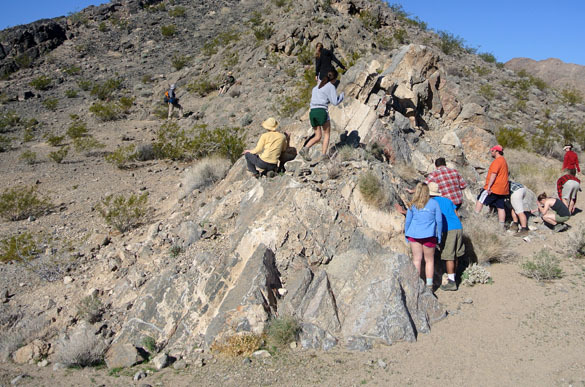 Here you can see Nick Wiesenberg and Kyle Burden checking out some nearby outcrops of deformed carbonates (probably the upper part of the Bird Springs Formation, which is Permian in age). 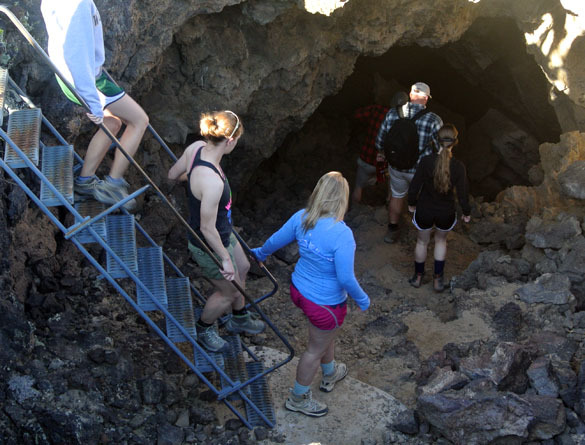 This was a chance to break in our boots and stretch our legs before settling into our quarters. The weather is overcast right now, but will dramatically improve tomorrow for the rest of the week. 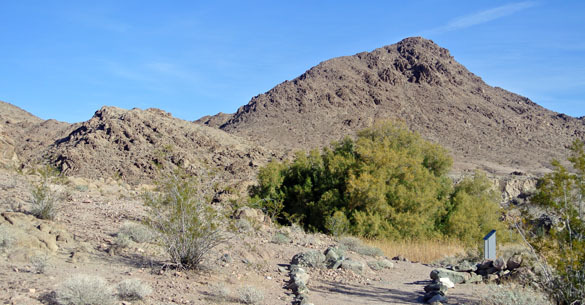 The weather promises to be excellent for the week we are in the Mojave. All is well as the adventure begins!